Octavia is an elegant four bedroom apartment situated on the first floor of a beautifully preserved building very close to the Spanish Steps. The neighborhood has fine boutiques, grocery stores, a little vegetable market and pastry shops. There are many typical Italian restaurants, which between March and late October put their tables outside. Sit, relax and sip a glass of wine, while soaking up the Roman ambiance. The Spanish Steps, the Trevi Fountain, the Villa Borghese and its museum, the Pantheon and Piazza Navona are all within an easy walk from Octavia. Octavia has lovely, large windows and beautiful, antique furniture. 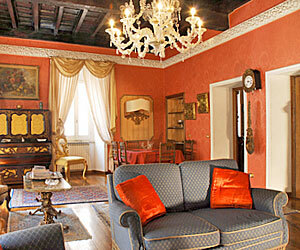 The apartment is composed of a spacious, bright living room with comfortable couches surrounding the decorative fireplace, a dining area and characteristic beamed ceiling, three double bedrooms, three bathrooms (one with bathtub and two with showers), a large fully equipped kitchen and a narrow balcony overlooking the neighborhood. On request, a very small bedroom with a single sofa bed (perfect for a child or nanny) is available. The single bedroom is very small. It has a single sofa bed and an armoire, but is narrow with no windows.